Firefox 3.5 is now out and available in more than 70 languages. I say “rough” because I didn’t verify every language and I might be off by one or two. I was surprised at how few languages Safari supports; 16 languages used to be a lot not that long ago. But not anymore. And I think it’s safe to say that Firefox is the most global browser on the market today. 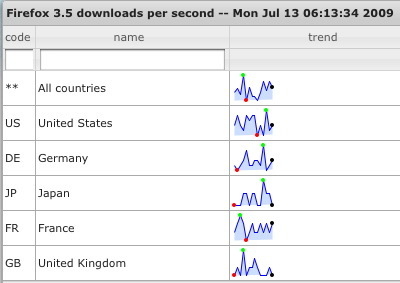 If you want to see how popular Firefox is around the world, check out the real-time download map here. The last I checked there were 23 million downloads with 5 million coming from the US, followed by Germany, Japan, and France. I particularly like how you can look up countries by ccTLD. Seth Bindernagel (who works on localization at Mozilla) has a recent post about the growth of locales for Firefox.